If you are looking for sheets that are soft, silky and cool to the touch, Rayon from 100% Bamboo sheets may be the answer. 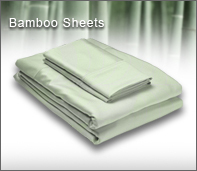 When it comes to bamboo bedding OBS recommends you look for sheets that are rayon made from 100% bamboo. Pure bamboo fabric sheets contain millions of gaps and holes at the microscopic level, giving it a very comfortable porosity. In other words, this is a fabric that breathes, so it wicks moisture from your body even better than cotton! keeping you cool in the summer. Silky-soft, Made Fom Natural Bamboo, Cool, Breathable and Sustainable, ISO9000 and ISO14000 Quality.